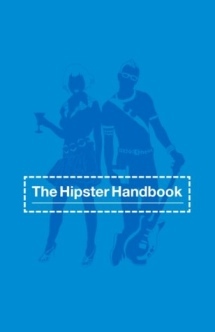 The Hipster Handbook covers modern bohemian youth culture in the United States. The author wrote the book "for money and chicks," and it shows. Since its publication seven years ago, hipster culture has undergone a few transformations, but most of the content is still relevant today. In the United States, the word "hipster" is used pejoratively to denote a subculture of bohemian young adults from (mostly) privileged backgrounds. The word is also used by people who, to an untrained eye, look like hipsters themselves. An elitist attitude, asymmetrical hairstyle, parental financial support and a certain disconnection from reality are all hallmarks of the hipster, or at least the hipster cliché. This subculture has undergone considerable evolution since the mid-90s, when books like Ghost World first started to chronicle a new subculture, focused on pop culture esoterica and a life outside the traditional class system. During the 1990s, hipsters were not seen in quite the light they are today, perhaps due to the small size of the population, and the lack of imitators. The book is full of slang that I have never heard, such as "CK-1" being slang for "bisexual." It might be an East Coast thing, or perhaps the book has aged badly, as the avant-garde always does. The illustrations showed people in outfits any lookbook browser will recognize. In The Hipster Handbook, Lanham outlines, tongue firmly in cheek, how this new subculture of young adults spends a great deal of time on superficial details that give them the illusion of depth. Various subtypes are discussed, including blue collar hipsters, Unemployed Trust Funders, loners and so on. These descriptions are funny, in part because they bear a passing resemblance to actual people. I found myself sickened and rather depressed by the Hipster Handbook. It was written in 2003, well before the financial crisis. Reading about the expensive lifestyles of these young people, financed by family money and service jobs, makes me fear for the artistic future of this country. Unlike hipster dykes, or other, related subcultures, Mr. Lanham's hipsters live empty and rather aimless lives, a bit like the protagonist of Moravia's Boredom . This is a recipe for bad art, especially when the people around you are capable of parroting deep thought, but not of thinking it. I should say, by way of explanation, that I am not the audience for this book. Though he tries hard to be funny, Lanham cannot conceal the veiled hostility that inflects much of his writing. I find veiled hostility as charming as open hostility, and would not read it except for money. Adult life is hard, especially in the beginning. People who are allowed to escape into a carefree, open-ended adolescence, to discover themselves out from under the thumb of the boss, are resented by people who don't have this option open to them. And why shouldn't they be? But there is another aspect, hinted at but never quite stated by Lanham. For many years, these symbols––the Ray-Ban glasses, the band t-shirt, etc.––served as code to other intelligent, artistic young people that they held similar interests. These symbols have been corrupted by fakers, imitators and cachet hunters. This only increases the hostility of the old guard, as well as those lonely young people looking for friends, not "scenesters." Most hipsters give little evidence of talent, hidden or otherwise. I don't say this to be mean. Anyone who's wandered through a district like Kreuzberg, Williamsburg, The Mission or Wicker Park cannot conceal this fact from themselves. View the art on display in these neighborhoods, or go to the open mic nights, or peruse the local literary magazines. See for yourself. Good artists exist, but they are vastly outnumbered by the bad and the ugly. Perhaps it was ever thus. Return to Enjoy Your Style's book reviews page.